Toyota's president has apologised to the US Congress and American Toyota owners for safety problems that led to deaths and worldwide recalls. Akio Toyoda said he was "deeply sorry" for any incidents which had occurred as a result of failures with accelerators and brakes on several models. Mr Toyoda pledged his "full co-operation" with the US investigation. But, under questioning, he insisted no faults had been discovered with the electronics of any of its vehicles. He pledged that an independent, outside advisory board would look into the issue. Toyota has recalled about 8.5 million vehicles worldwide. Toyota's assurances that faulty electronics were not the cause of faulty accelerator or brake pedals in Toyota or Lexus models do not appear to have convinced the politicians. And its reluctance to remove encryption of so-called "black boxes" in its cars also upset the committee members. Earlier the chairman of the House Oversight and Government Reform Committee, Edolphus Towns, said Toyota and regulators had "failed their customers" on safety. And Transport Secretary Ray LaHood told the hearing that all vehicles which had been recalled were "not safe". But he added that Mr Toyoda's scheduled appearance showed that world's biggest car maker was no longer "safety deaf" to complaints and concerns. The reputation of Toyota has been severely damaged by a string of major problems across a range of vehicles. The main issues have been faulty accelerator pedals, accelerator pedals getting stuck in floor mats, and a problem with braking systems on its hybrid models. 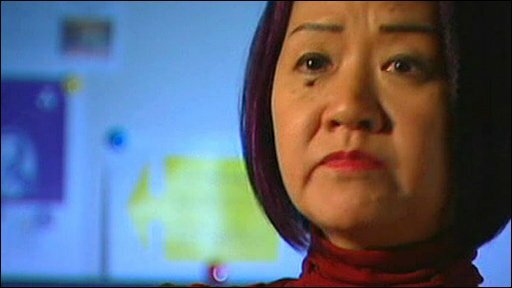 Fe Lastrella, who lost four family members in a crash caused by a faulty accelerator on a Toyota, gave evidence after Mr Toyoda. Mrs Lastrella's son Chris, daughter Cleofe, Cleofe's husband Mark Saylor and the couple's daughter Mahala were killed on 28 August 2009 in California - an incident that led to renewed US government scrutiny of problems with acceleration in some models. "To the honourable members of the committee and the honourable members of the congress, the answer lies in your hands," she said. Under questioning, Mr Toyoda said the company had shared with US authorities all the information it had about unintended acceleration problems. 23 Feb - Congressional hearings begin, with Toyota's head of US operations, James Lentz, among the first to be grilled. 24 Feb - Toyota's president Akio Toyoda faces politicians in day two of the hearing. Why is it not called Toyoda? In remarks which he read to the House, Mr Toyoda admitted that the firm's expansion "may have been too quick". He was joined by Yoshimi Inaba, president and chief executive of Toyota Motor North America, who answered questions in English. Mr Toyoda read his opening statement in English, but answered questions in Japanese, through a translator. Mr Toyoda is the highest-profile figure to appear before the politicians. He had initially said that he would stay in Japan and not face Congress but changed his mind last week after a formal request from the committee chairman. The grandson of the company's founder, Mr Toyoda said in prepared remarks that he took a personal responsibility for improving the quality of Toyota cars. "All the Toyota vehicles bear my name. For me, when the cars are damaged, it is as though I am as well. I, more than anyone, wish for Toyota's cars to be safe, and for our customers to feel safe when they use our vehicles." And he added: "We pursued growth over the speed at which we were able to develop our people and our organisation and we should be sincerely mindful of that." Chairman Towns said he was "impressed "that Mr Toyoda had agreed to testify voluntarily. "It shows your commitment to safety as well," Mr Towns added. Are you in Japan? What is your view of the problems with Toyota cars? 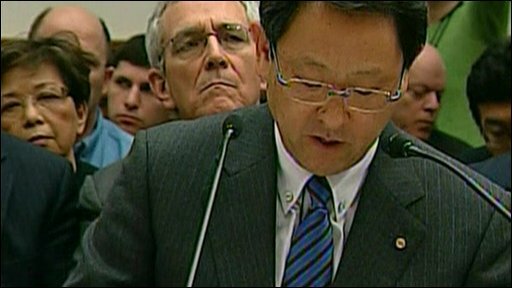 How do you feel about Akio Toyoda apologising to the US Congress? Send us your views using the form below.